This recipe is so elegant you won’t believe how simple it is! Just three ingredients and a few minutes prep! Start it the night before and it’ll be all set for your party the next day. Crackers, crostini or sliced baguette, for serving. Beat cheese spread until soft, mold it into a ball and wrap in plastic wrap. Refrigerate overnight, or at least 4 hours. In a small bowl, add the bacon. 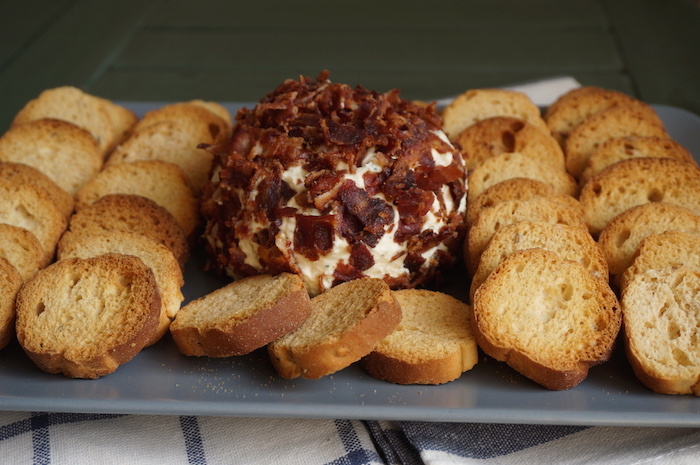 Unwrap the cheese ball and roll into the bacon until completely covered. Refrigerate. Let soften slightly before serving.